I almost tagged along with Pig-farmer this week on his business trip. So this morning, after chores of course, I declared it a “Staycation” day. I made some Pillsbury Key Lime cupcakes as they sounded tropical-ish. Plus, I had the box conveniently in my pantry. Our cool, fall morning begged for apple cider with Aspen Mulling Spices. Now, I plan to do some brainstorming of sorts and reading. Right there in that cozy chair tucked into our dining room corner. 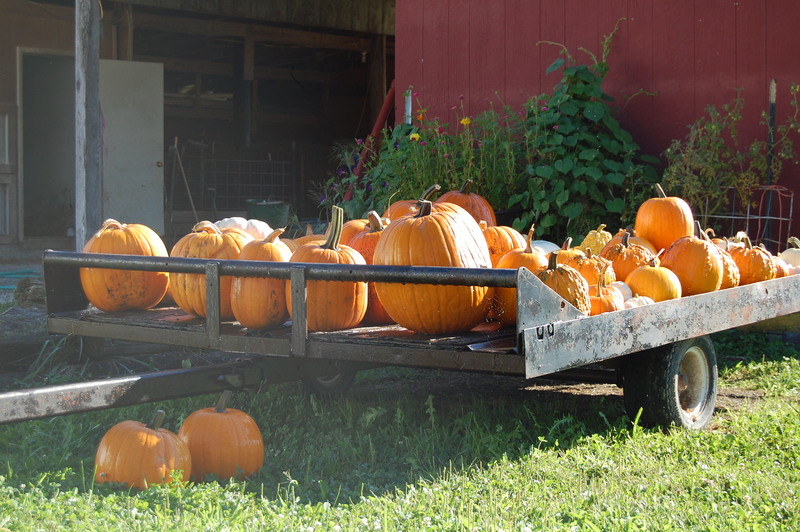 Also, since it is Photo Friday and to get you in the mood for fall, pumpkin harvest has begun! Love it! This isn’t all of them; just a start. Although I didn’t have as big a plot as last year. The ornamental corn is still not ready. I hope it is soon! For today, friends, I hope you have a cupcake, or apple cider, or both! 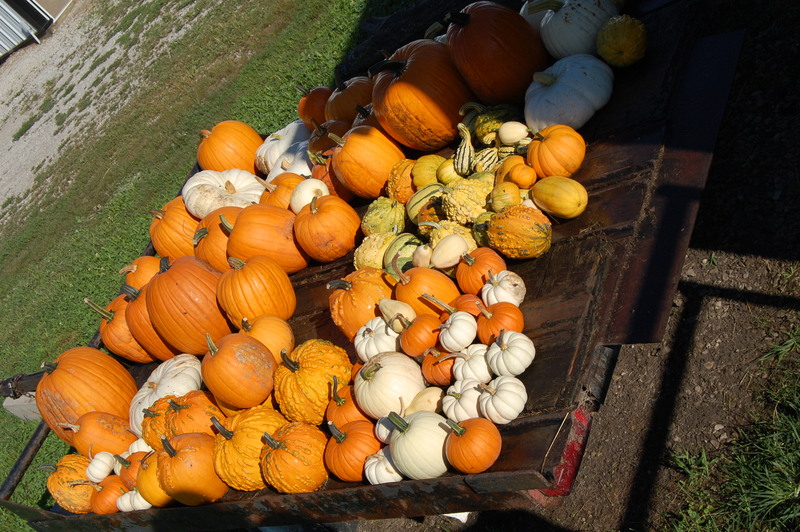 This entry was posted in Country Living, Friends and Family, Positive Thinking, Pumpkin Patch and tagged Apple Cider, Aspen Mulling Spices, Cupcakes, Illinois Country Life, Pig-farmer, pumpkins, Signs of fall, Staycation. Bookmark the permalink. I am definitely getting in an autumn mood….! 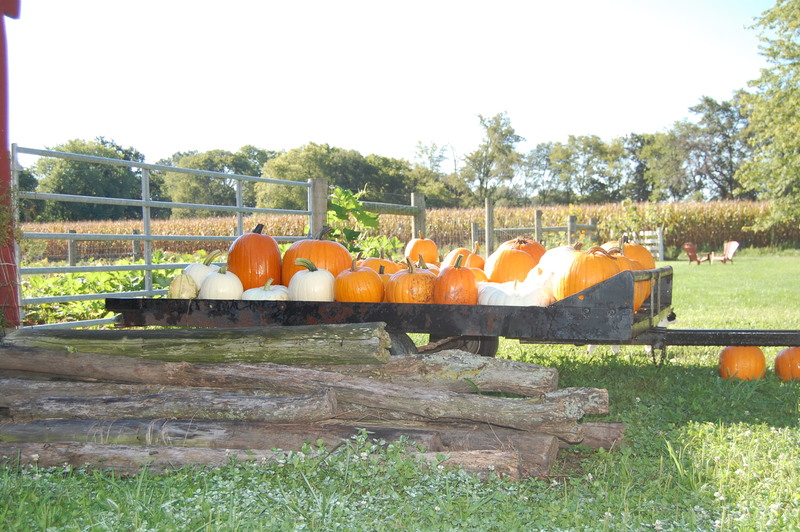 Those are some of the pumpkins from your front yard? I like the warty ones – kewel looking. Didn’t you re-do an upstairs bedroom? Did we ever see pics of that, other than the floor? Was riding behind a pick-up truck today with a vanity license plate that said P-Farmer. Natch, I though Pig Farmer should have one. The pumpkins, yes! They are from my front yard. They have done well! Love the license plate and that you thought of us! Ah, I had forgotten that I had seen that. Thanks for looking for it for me. A day off from the daily work is alway such a treat! The day went so fast, too! A Staycation sounds so good right now. I hope you can schedule one soon. They are good for the soul.